I am really looking forward to popping up in a new venue at the end of the month and here’s the menu. Please note this event will not be BYO as GB Pizza is a fully licensed venue. Following requests for more dishes to suit vegetarians and non meat eaters, and to celebrate the abundance of great fish and vegetables that we have at this time of the year I have designed a slightly different menu from usual and each course will be made up of large platters to share. After my tests in the wood fired oven at GB Pizza I had to sneak the lamb cutlets on though, it would have been criminal not to! 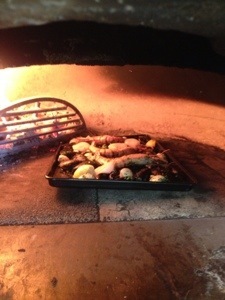 Trying out the wood fired oven. YUM! As I mentioned previously the emwilco supperclub is going on the road again at the end of September, this time to Margate. The menu will be entirely shaped by what I can cook in GB Pizza‘s ‘bijou’ kitchen and using their wood burning pizza oven. I went and had fun trying it out earlier this week so I can assure you it will be delicious. 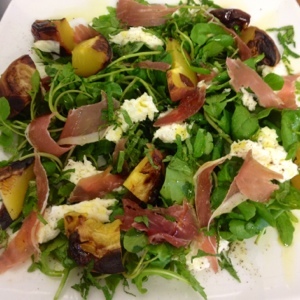 We tried roasted peaches served with English air dried ham, mozzarella and rocket. 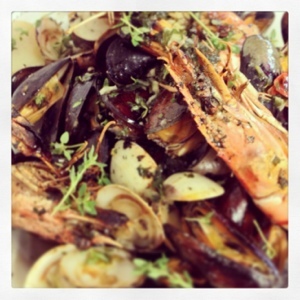 Then a mixture of clams, mussels, prawns and scallops roasted with lemon and garlic which were seriously yummy, smokey and toothsome. 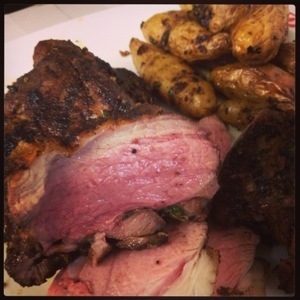 Next I roasted a Moroccan spiced, boned leg of lamb with little waxy Anya potatoes tucked underneath and finally some lemony miniature lamb chops which took just four minutes in the fiercely hot oven, oh my they were good. It was such a treat and huge thanks to Rachel and Lisa who are the brilliant GB Pizza ladies. This is going to be a good one! Other than location, the other main difference will be that for each course a selection of dishes will be presented as sharing platters and there will definitely be plenty to keep non-meat eaters happy. As GB Pizza are a licensed venue this will not be a BYO event, they will be offering carafes of wine and their usual selection of beers for sale on the night. Booking however will be by the usual route and will open a fortnight before. The weather finally seems to be making an attempt at Spring and there has certainly been some rapid growth in the garden so hopefully the fresh, fabulous produce we are all waiting for will soon appear. I had hoped to be able to include asparagus on the menu but there is very little sign of it so far. If some does pop up over the next fortnight then I may well tweak the menu, but for now our greenery will come in the form of a vivid nettle and wild garlic soup which has become a favourite of mine and of which there is plenty! To follow, a rich crab tart based on a recipe that one of the chefs at Quaglinos gave me years ago when I worked there. I used to do a twelve hour shift on Fridays and Saturdays, starting at lunchtime and getting home early enough to pick up the next day’s papers as I drove through Camden. Often wrapped up in a piece of greaseproof paper in my bag would be a hastily (and cheekily..) grabbed slice of crab tart from the kitchen. I hope to recreate the flavours for you and memories for me, wonderfully crisp pastry and warm filling using the freshest crabs from West Whelks in Whitstable. 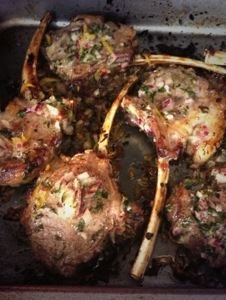 The main course will be lamb, dainty cutlets with new potatoes and purple sprouting. To round it all off a rich chocolate pot and gorgeous chewy Amaretti biscuit an Ottolenghi favourite of mine. I hope to see you there, booking will open on Sunday. Having set the menu I tried out my old fave the rhubarb and saffron tart and rather sadly found it wanting. So if it isn’t good enough for me then it isn’t good enough for all my lovely guests. Today I have been playing with alternatives, including a steamed sponge with a rhubarb and cardamom ‘jam’ which was sooooo delicious, but this little beauty won. 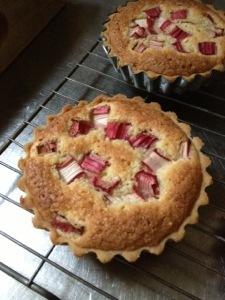 A rhubarb and frangipane tart which will come with Kentish créme fraiche.